The Central African Empire (CAE) was the name of the short-lived, self-declared autocratic monarchy that replaced the Central African Republic (CAR) on 04 December 1976. The CAE was formed when Jean-Bédel Bokassa, President of the CAR declared himself Emperor Bokassa I at a coronation ceremony which is estimated to have cost US$20 million, roughly a quarter of the country's annual income. Although it was claimed that the new empire would be a constitutional monarchy, no significant democratic reforms were made and suppression of dissenters remained widespread. The former president, David Dacko, was returned to power with French support ("Opération Barracuda") while Bokassa was away in Libya on 20 September 1979. The monarchy was abolished and the name "Central African Republic" was restored on 21 September 1979 (Source: Wikipedia). There was no change to the national flag of the country during this period and the flag adopted on 01 December 1958 remained in use. During the rule of Bokassa I the national flag remained unaltered. There was, however, an Imperial Flag. 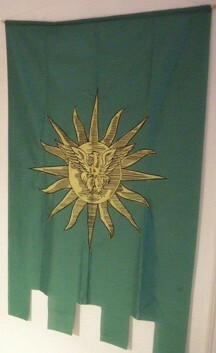 This was green, with a 20-pointed gold star in the middle upon which was an eagle with spread wings (also in gold). As hinted by Whitney Smith [smi1982], it seems that Bokassa took the eagle emblem in reference to the eagle used by French Emperor Napoleon Bonaparte, who seems have been his "idol". A photograph of the royal banner of the Emperor Bokassa I shows the green to be darker than that which is illustrated above. 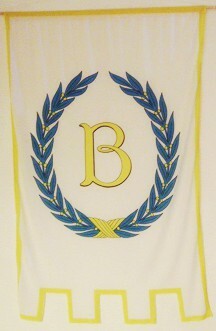 The royal family banner of the Emperor Bokassa has gold letter "B" within a blue garland. The Coat of Arms of the Central African Empire were adapted from those of the Central African Republic to reflect the political changes and were designed by Juan Fandos-Rius (see further details here).